Home / Life at the Manor / They don’t call ’em Shedders for nothing. They don’t call ’em Shedders for nothing. Tonight, I curried and raked Sid. That is my foot for scale. There is a reason I adore my Dobermans in coat-blowing season. 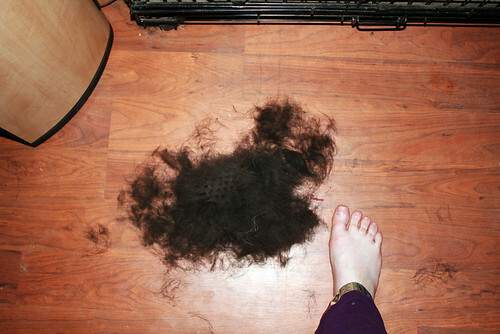 And actually it was my friend Steph who I stole the “German Shedder” thing from. But it fits. Oh god, it fits. Oh god. In other news, we had a guy come out tonight to sell us a heat pump. The old one is as old as the house. They have a promotion on with a free digital filter. I asked where they would install it and how hard it was to clean, adding “with all the dogs…” He looked briefly startled and said “Yeah, you don’t want that filter.” So we’re not getting it. But we do get a new heat pump on Monday! Pft. I should show you what a Cattle Dog does. Val makes more hair than she HAS.